In a troubled economy, not very many businesses get to celebrate their ruby anniversary. Congratulations Multi-Pure! Multi-Pure International, a pioneer in the home water filtration. industry, is celebrating its 40th Anniversary. Founded in 1970 by brothers H. Allen & Alvin Rice, the company has grown to be one of the largest manufacturers of carbon block filters in the world and is certified by NSF to reduce more contaminants than any other filter on the market. 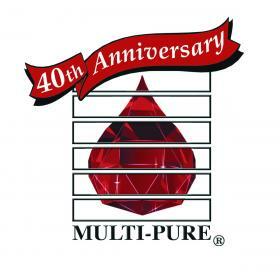 Today, Multi-Pure International is still a family owned and operated company. Multi-Pure was founded on December 7th, 1970 as a marketing company, selling point-of-use drinking water systems door-to-door in the Los Angeles area. By the mid 1970?s, the company had developed the carbon block filter, and was actively manufacturing for its own Multi-Pure brand as well as the OEM market. In addition to manufacturing, Multi-Pure opened a network marketing program in 1982. This program is still active, with thousands of successful independent distributors across the country. Multi-Pure is known in the industry as a manufacturer of high performance filter products. Emphasizing quality over quantity, the company has developed a broad base of customers who wish to offer the highest performing products with the widest range of contaminant removal. As a leader of a growing industry, Multi-Pure co-founder and President, Alvin Rice, says he is excited for a bright future, ?I?m often asked about my favorite moment in Multi-Pure?s long history, I say that moment hasn?t happened yet; we?re more excited for things to come.? Today Multi-Pure and its manufacturing subsidiary, Carbon Block Technology, are located in Las Vegas, Nevada, with an additional manufacturing subsidiary, CB Tech Shanghai, located in China. Together the three companies cut a wide swath across the drinking water industry as both a manufacturer of carbon block components, as well as a marketer of drinking water systems. Copyright © http://indianawaterfilters.org/essentialwaterblog 2010 - 2019 all rights reserved.